Launching in October 2014, GlamStar will be a hands-on guide equipping stylists with the technical know-how to push their skills and knowledge levels to global standards. GlamStar editorial will focus on the Indian audience and its unique needs. 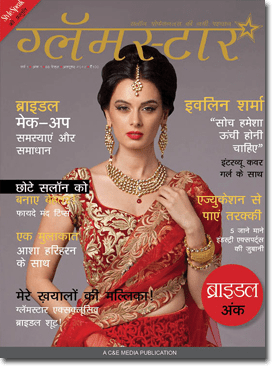 It will have a dedicated Bridal section every month, featuring hair, make-up and trends; the magazine will also focus on providing Step-by-Step tutorials for hair & make-up; apart from that GlamStar will also contain information on gadget and product innovations. It will be a distinctly different offering focussing more on being a guidebook of the current trends and styles in India in place, with special sections on education.. It will provide tutorials, business and creative tips, in addition to creative inspiration- all in one of India’s most spoken languages. GlamStar will allow Hindi-speaking professionals to drastically improve their know-how of the industry, while bringing their latent skills up to globally acceptable standards.